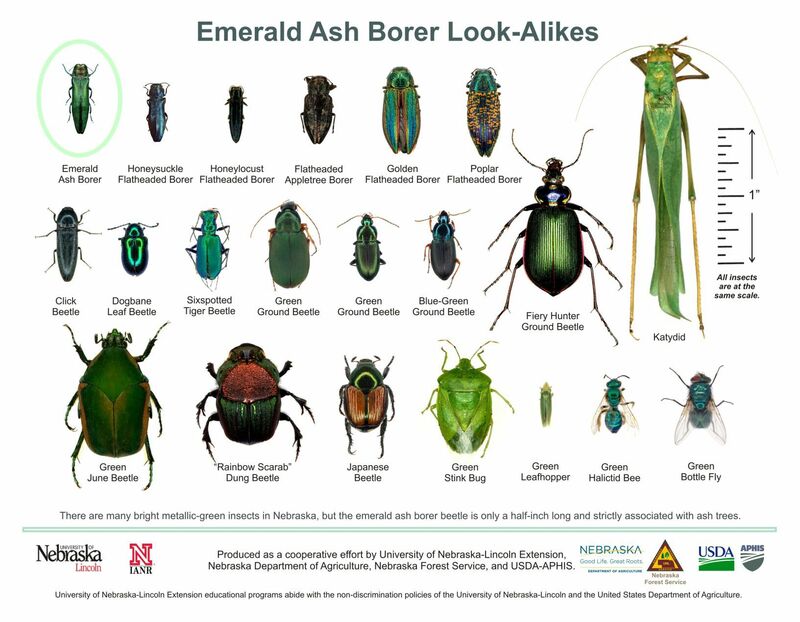 Have you heard of the Emerald Ash Borer? You should if you have ever been to a camp, park or trail location in WI and across the United States and Canada. 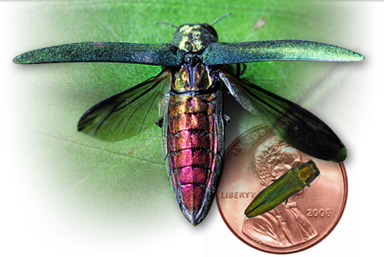 Emerald Ash Borer (Agrilus planipennis) is an invasive, wood boring beetle. It kills ash trees (Fraxinus spp) by eating the tissues under the bark. This metallic green beetle is native to East Asia. It was brought to the United States accidentally, in the wood of shipping crates from China. The larva (the immature stage of EAB) spends its life inside ash trees, feeding on the inner bark where we cannot see it. This feeding disrupts the trees’ ability to move water and nutrients back and forth from the roots to the rest of the tree. The tree starves and eventually dies. 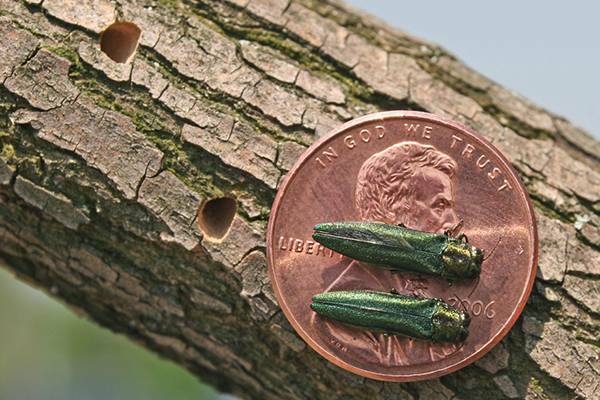 Emerald ash borer adults are very small, metallic green beetles. They are about the size of a cooked grain of rice: only 3/8 – 1/2 inch long and 1/16 inch wide. 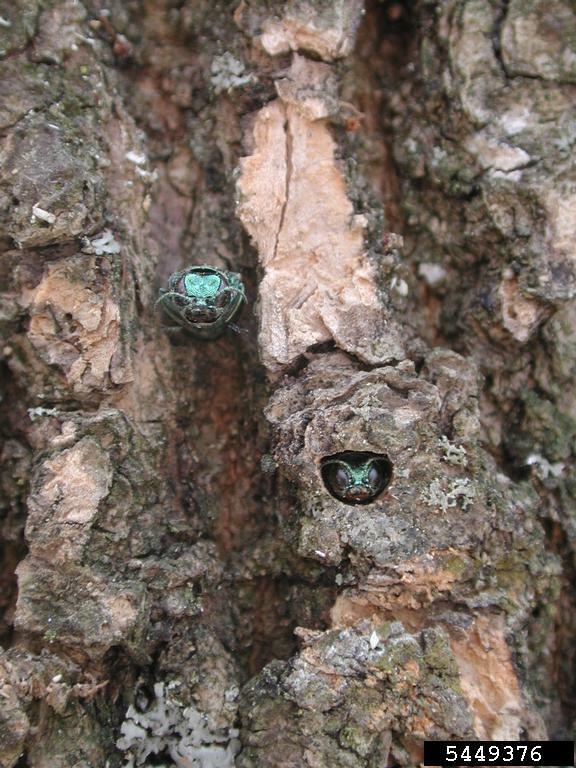 Adult emerald ash borers emerge from beneath the bark of ash trees late May through mid-July. They create a D-shaped exit hole as they chew their way out of the tree (pictured on the left). The beetles are most active during warm and sunny days. They never wander far from where they exit a tree (less than one mile) in search of a mate. Once they find a mate, the female will lay 60 – 90 eggs, one at a time, in the crevices of ash tree bark. The beetles will feed lightly on ash tree leaves, but do not cause much harm that way. 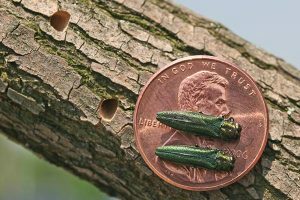 EAB beetles live a total of three to six weeks. 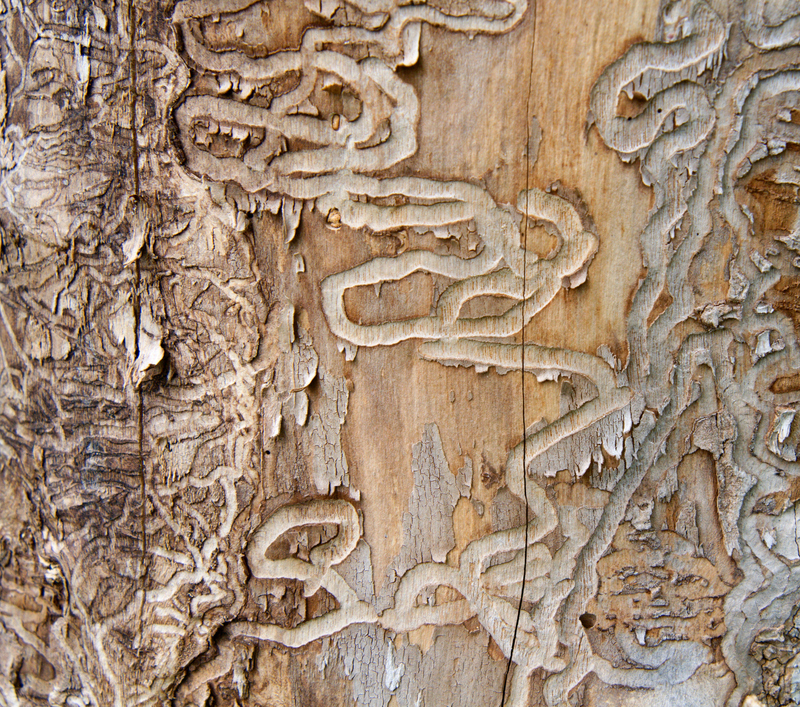 Emerald ash borer larvae are white and slightly flattened, with a pair of brown pincher-like appendages on the last segment. Their size varies as they feed and grow under the ash tree’s bark. Full grown larvae average 1.5 inches in length. They wind back and forth as they feed, creating S-shaped patterns called galleries under the bark (pictured on right). 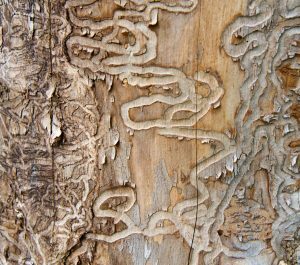 Larvae will feed under the bark for one or two years and can survive in green wood, such as firewood, as long as the bark is attached. WALWORTH COUNTY IS A QUARANTINE COUNTY! What is Wisconsin doing to prevent EAB? 2. Restricting the movement of firewood and materials that could potentially carry EAB into new locations. DATCP rule (DATCP 21), allows our state to restrict the movement of certain items coming from areas infested with emerald ash borer (EAB quarantined areas). These items include firewood, logs, mulch or nursery stock. DNR rule NR 45.04 (1) (g) restricts firewood movement onto DNR managed properties in Wisconsin to prevent the spread of EAB to Wisconsin forests and recreational areas.